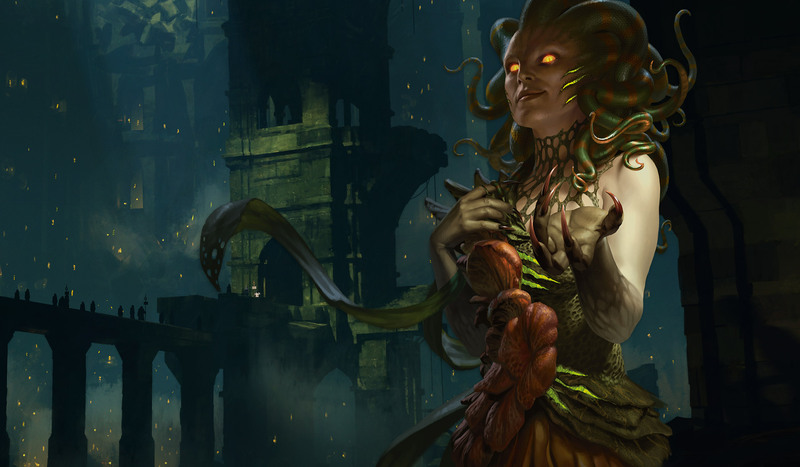 During her time on Ravnica, Vraska has provided certain dark services to the Golgari guild. Her magic helps her track her chosen marks through the fungus-choked tunnels of the undercity, where she destroys her victims quietly. When necessary, she can even summon shadowy killers to do her dirty work for her. The Golgari see her as a useful enigma: a shadowy death specialist who only responds to the jobs she wants in exchange for strange favors and obscure trophies. Vraska stays largely out of guild politics and cares little about the inner workings of the Golgari Swarm. She gets the job done and departs again, not to be seen until another mission interests her. Vraska's power is clear, but her true motivations are a mystery, even to other gorgons. Unknown to the Golgari Swarm, she spends a significant portion of her time on planes other than Ravnica, using her death-dealing powers to slowly build a collection of petrified victims from across the universe. Take a closer look at who Vraska is and how she came into the service of one of the Multiverse's greatest villains. Mazirek, death priest and leader of the kraul, refuses to sit idly by while his people are routinely ignored by Guildmaster Jarad and his ilk.